Please check out our latest tasting at our Instagram site. Here are some recent highlights as well. 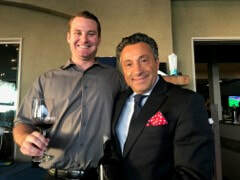 Taste of Wine and Food, Rico Cassoni was at Sea Salt Del Mar's Prisoner Wine Company (PWC) Wine Pairing Dinner, Saturday 4/28. Sea Salt Owner Sal Ercolano (right) boldly went where no other has gone before with three consecutive SOLD OUT nights for a wine dinner and kidded that he was even thinking of a fourth evening. Also pictured is Southern Wine Distributor Alex Hare (left) educating guests on the PWC delicious wines including Derange being held. 2017 Top 10 at North County Wine Co. Thanks Jim for allowing Taste of Wine (Franco and Rico) to partake in North County Wine Company's Top 10 for 2017. Rico Cassoni enjoyed the COHO with family in Rancho Mirage.